(Nanowerk News) Researchers from RIKEN and the University of Tokyo have developed an organic dye molecule with tunable light-absorption and color characteristics ("18π-Electron Tautomeric Benziphthalocyanine: A Functional Near-Infrared Dye with Tunable Aromaticity"). This development promises to open the door to the creation of new functional dyes for bioimaging and solar cell applications. The research team, led by Atsuya Muranaka and Masanobu Uchiyama from the RIKEN Elements Chemistry Laboratory and the RIKEN Center for Sustainable Resource Science, was attempting to modify the electronic structure of a widely used organic dye molecule known as phthalocyanine. This dye molecule is shaped like a four-leaf clover, with a central ring of 16 atoms, alternating between carbon and nitrogen, surrounded by four cyclic organic units called isoindoline. It contains 18 electrons in configurations, existing as electron clouds on either side of the large central ring. The circulation of these delocalized electrons around the ring stabilizes the molecule—an effect known as aromaticity—and also affects the molecule’s light-absorption properties. The researchers replaced one of the isoindoline units in phthalocyanine with a simpler, benzene-based chemical group to give a class of molecules called benziphthalocyanines, which benefit from the 18-electron aromatic stabilization. X-ray crystallographic analyses revealed that the central ring of their benziphthalocyanine was entirely flat, as expected for a molecule stabilized by a cloud of aromatic electrons, and that the length of the bonds between the ring’s atoms matched those of phthalocyanine. The results of nuclear magnetic resonance experiments, however, suggested that the molecule could exist in two different forms, with either weak or strong aromaticity, each having different light-absorption characteristics. “The change in aromaticity also changed the molecule’s color,” says Muranaka. Switching between these two forms could be achieved rapidly in solution. 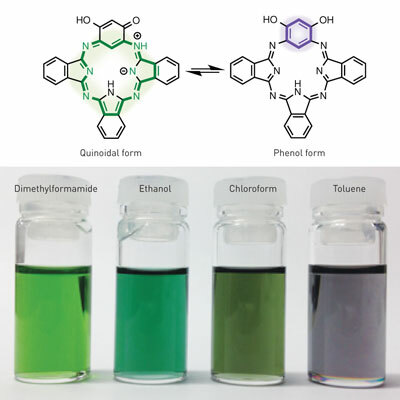 The addition of specific solvents shifted the equilibrium of the system either toward the strongly aromatic ‘quinoidal’ form of benziphthalocyanine molecules or toward the weakly aromatic ‘phenol’ form, resulting in a change in the color of the solution (Fig. 1). Various chemical reagents could also be used to stop this interconversion, trapping the benziphthalocyanine in the quinoidal or phenol configuration. Since each of these new molecules absorbs a unique spectrum of light, this could offer a way to tune the optical properties of many different types of benziphthalocyanines. The researchers are now working to improve the optical properties of their benziphthalocyanine dyes. They are also trying to create a switchable dye in which light absorption can be activated or deactivated by switching aromaticity on or off.